Jennifer joined the team as Practice Secretary at Evidence-Based Therapy Centre in January 2016. 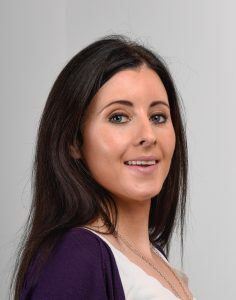 She is a graduate of Galway-Mayo Institute of Technology with a Bachelor of Business degree. She has also undergone additional specialist training to develop her secretarial skills. With a strong background in retail, Jennifer has exemplary customer service skills and her friendly, approachable and highly personable manner is a huge asset at Evidence-Based Therapy Centre. Jennifer ensures the smooth day-to-day running of the practice and is your point of contact for all bookings, appointments or enquires about our full range of services. Jennifer can be contacted on 091 727777 Monday – Friday 9am – 5pm.